Looking for a fun indoor activity or an original thrilling experience that can be enjoyed by the entire family? Come shoot each other with a real bow and safety-patented foam arrows at Archery District Toronto. This is a completely safe, kid-friendly, and supervised by professionals. No archery experience required! 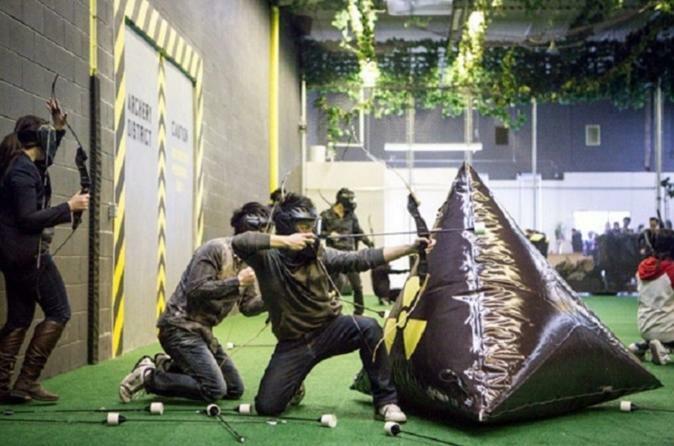 Find your inner warrior at the first archery tag facility in Canada! Your all-inclusive package begins with a debriefing and training session. The knowledgeable staff will teach you the basics of archery and guide you every step of the way on the road to become the ultimate bowslinger. After learning the way of the archer, take a moment to collect your thoughts and channel your instincts as you step into the massive combat archery arena. Shoot, run, dodge, survive, and hopefully the odds will be ever in your favor! On the day of your booking, please arrive 30 minutes before your scheduled time to sign waivers and go through training. You must bring a clean pair of shoes. Due to the high intensity nature of the activity, it's also highly recommend you wear comfortable athletic clothing such as shorts and t-shirts. Please Note: A piece of government-issued ID is required for everyone above the age of 18.